"Æthelred 32 (Male) the Unready; king of the English, 978–1016". Prosopography of Anglo-Saxon England. Retrieved 25 November 2007. Cubitt, Catherine (2012). "The politics of remorse: penance and royal piety in the reign of Æthelred the Unready". Historical Research 85 (228): 179–192. Keynes, Simon (1980). 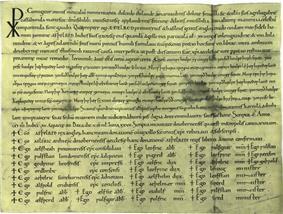 The Diplomas of King Æthelred ‘the Unready’ 978–1016. New York: Cambridge University Press. Lavelle, Ryan (2008). Aethelred II: King of the English 978–1016 (New ed.). Stroud, Gloucestershire: The History Press. Keynes, Simon, "Æthelred II (c.966x8–1016)", in C. Matthew, B. Harrison, & L. Goldman (eds. ), Oxford Dictionary of National Biography (2004), http://www.oxforddnb.com [accessed 12 June 2008]. Turner, Ralph V. (1968). "The Origins of the Medieval English Jury: Frankish, English, or Scandinavian?". The Journal of British Studies 7 (2): 1–10. Wormald, Patrick (1999). "Neighbors, Courts, and Kings: Reflections on Michael Macnair's Vicini". ^ The use of either the cognomen or the numeral distinguishes him from King Æthelred of Wessex, who ruled from 865 to 871. ^ Wickham, Chris. "Problems in Doing Comparative History". In Skinner. Challenging the Boundaries of Medieval History. pp. 15, 22, 27. ^ a b Hart, Cyril (2007). "Oxford Dictionary of National Biography". Oxford: Oxford University Press. Retrieved 9 November 2008. ^ Keynes, The Diplomas of King Æthelred 'the Unready' 978-1016, p. 166. ^ a b c d e f g h i j Keynes, "Æthelred II (c.966x8–1016)." ^ The Burial of King Æthelred the Unready at St. Paul's, Simon Keynes, The English and Their Legacy, 900-1200: Essays in Honour of Ann Williams, ed. David Roffe, (Boydell Press, 2012), 129. ^ . Encyclopædia Britannica. 2009. p. 1. The 'legend' of an Anglo-Saxon origin to the jury was first challenged seriously by Heinrich Brunner in 1872, who claimed that evidence of the jury was only seen for the first time during the reign of Henry II, some 200 years after the end of the Anglo-Saxon period, and that the practice had originated with the Franks, who in turn had influenced the Normans, who thence introduced it to England. Since Brunner's thesis, the origin of the English jury has been much disputed. Throughout the twentieth century, legal historians disagreed about whether the practice was English in origin, or was introduced, directly or indirectly, from either Scandinavia or Francia. Recently, the legal historians Patrick Wormald and Michael Macnair have reasserted arguments in favour of finding in practices current during the Anglo-Saxon period traces of the Angevin practice of conducting inquests using bodies of sworn, private witnesses. Wormald has gone as far as to present evidence suggesting that the English practice outlined in Æthelred's Wantage code is at least as old as, if not older than, 975, and ultimately traces it back to a Carolingian model (something Brinner had done). However, no scholarly consensus has yet been reached. Did Æthelred invent the jury? Short cross type penny with portrait of Æthelred II, struck in London. "[A] youth of graceful manners, handsome countenance, and fine person..." as well as "[A] tall, handsome man, elegant in manners, beautiful in countenance, and interesting in his deportment." Æthelred was buried in old St Paul's Cathedral, London. The tomb and his monument were destroyed along with the cathedral in the Great Fire of London in 1666. A modern monument in the crypt lists him among the important graves lost. Over the next months, Cnut conquered most of England, and Edmund had rejoined Æthelred to defend London when Æthelred died on 23 April 1016. The subsequent war between Edmund and Cnut ended in a decisive victory for Cnut at the Battle of Ashingdon on 18 October 1016. Edmund's reputation as a warrior was such that Cnut nevertheless agreed to divide England, Edmund taking Wessex and Cnut the whole of the country beyond the Thames. However, Edmund died on 30 November and Cnut became king of the whole country. An expedition the following year was bought off in early 1007 by tribute money of 36,000 pounds, and for the next two years England was free from attack. In 1008, the government created a new fleet of warships, organised on a national scale, but this was weakened when one of its commanders took to piracy, and the king and his council decided not to risk it in a general action. In Stenton's view: "The history of England in the next generation was really determined between 1009 and 1012...the ignominious collapse of the English defence caused a loss of morale which was irreparable." The Danish army of 1009, led by Thorkell the Tall and his brother Hemming, was the most formidable force to invade England since Æthelred became king. It harried England until it was bought off by 48,000 pounds in April 1012. On 13 November 1002, Æthelred ordered the massacre of all Danish men in England on St Brice's Day. No order of this kind could be carried out in more than a third of England, where the Danes were too strong, but Gunhilde, sister of Sweyn Forkbeard, King of Denmark, was said to have been among the victims. It is likely that a wish to avenge her was a principal motive for Sweyn's invasion of western England the following year. By 1004 Sweyn was in East Anglia, where he sacked Norwich. In this year, a nobleman of East Anglia, Ulfcytel Snillingr met Sweyn in force, and made an impression on the until-then rampant Danish expedition. Though Ulfcytel was eventually defeated, outside of Thetford, he caused the Danes heavy losses and was nearly able to destroy their ships. The Danish army left England for Denmark in 1005, perhaps because of their injuries sustained in East Anglia, perhaps from the very severe famine which afflicted the continent and the British Isles in that year. In 1001, a Danish fleet – perhaps the same fleet from 1000 – returned and ravaged west Sussex. During its movements, the fleet regularly returned to its base in the Isle of Wight. There was later an attempted attack in the south of Devon, though the English mounted a successful defence at Exeter. Nevertheless, Æthelred must have felt at a loss, and, in the Spring of 1002, the English bought a truce for 24,000 pounds. Æthelred's frequent payments of immense Danegelds are often held up as exemplary of the incompetency of his government and his own short-sightedness. However, Keynes points out that such payments had been practice for at least a century, and had been adopted by Alfred the Great, Charles the Bald, and many others. Indeed, in some cases it "may have seemed the best available way of protecting the people against loss of life, shelter, livestock, and crops. Though undeniably burdensome, it constituted a measure for which the king could rely on widespread support." In 997, Danish raids began again. According to Keynes, "there is no suggestion that this was a new fleet or army, and presumably the mercenary force created in 994 from the residue of the raiding army of 991 had turned on those whom it had been hired to protect." It harried Cornwall, Devon, western Somerset, and south Wales in 997, Dorset, Hampshire, and Sussex in 998. In 999, it raided Kent, and, in 1000, it left England for Normandy, perhaps because the English had refused in this latest wave of attacks to acquiesce to the Danish demands for gafol or tribute, which would come to be known as Danegeld, 'Dane-payment'. This sudden relief from attack Æthelred used to gather his thoughts, resources, and armies: the fleet's departure in 1000 "allowed Æthelred to carry out a devastation of Strathclyde, the motive for which is part of the lost history of the north."